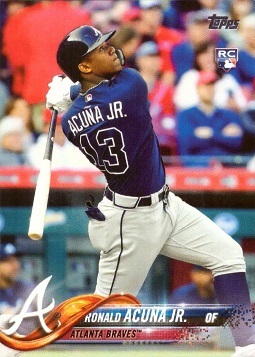 This is an official Ronald Acuna Rookie Card produced by Topps in 2018. In the upper right corner region of the card you will see the official RC logo, indicating that this is a true Rookie Card. In addition, this is a Short Print card, meaning they made less of these cards than other cards in the 2018 Topps Series 2 base set.